As you may know, the NM CCIM chapter #10 is collecting a series of stories about some of their most successful members – a task called “profiles in success”. Many of us have had people in our lives who we are grateful for – persons who show up at the right time and point us in a new direction, or people that provide invaluable insight that changes our course for the better. I am a 4th generation Commercial Realtor, and both of my parents were in the business and provided that role for me. In addition to that, I’ve been fortunate enough to grow up in a business and community of individuals that lean towards sharing, supporting, who focus on growing the pie instead of figuring out how to make their own piece larger. In turns out that isn’t by accident, but was by design. Over 30 years ago, a handful of commercial brokers assembled at one of the earliest meetings of the Leasing Information Network (now known as LIN). Like our country’s founding fathers, these brokers set down their ideals of how people in our business would interact. Cooperation was the key word of the day, with the idea that fees and information would be pulled out of individual silos and shared by all. 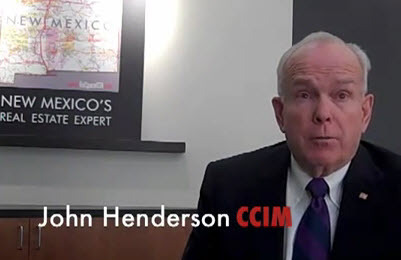 One of those leaders, John Henderson III CCIM, was an early mentor for me. I remember when I was a teenager John tactfully informed me that my personality could be improved by attending a Dale Carnegie course (he was right). When I started commercial real estate in 1989, John encouraged me to take a CCIM intro course as soon as possible, and like him, once I had the knowledge, I couldn’t stop. John went on to write a letter of support that helped me secure a CCIM 101 scholarship, and for me, the rest is history as CCIM has done more for my business than any other aspect of my life. With that thought in mind, it is my pleasure to share this video about John’s start in the business – some 40 years ago, John Henderson was a successfully residential Realtor, whose own life would be changed by a mentor to him. More on John’s beginning in commercial real estate can be found here at his video – http://www.nmcomreal.com/ccimintro2 . If after hearing these stories, you believe you might benefit from taking a CCIM course – the local chapter has an intro course this on February 7th and 8th – for $245, a 43% discount over the national rate. You can register for the course at www.nmcomreal.com/ccim . Previous: Interested in becoming a CCIM?